In this richly detailed history, Lizzie Collingham reveals how control of food and its production shaped the events of World War II. At least twenty million people died from starvation, malnutrition, and its associated diseases during the war, a number equal to the nineteen and a half million military deaths. 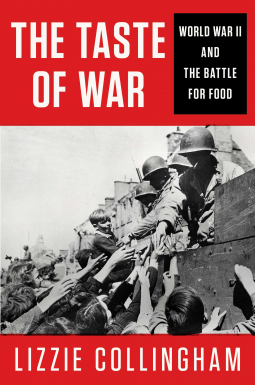 Tracing the interaction between food and strategy on both the military and home fronts, this original account demonstrates how access to food drove both Nazi Germany and imperial Japan to occupation. With the deprivation of World War I fresh in German minds, the pursuit of resources directly contributed to the Nazi decision to murder hundreds of thousands of "useless eaters" in Europe. Yet as The Taste of War brings to light, war related famine was not caused by the Axis powers alone. Allied mismanagement and neglect brought its own devastation. The British rationing system is often celebrated for having done a remarkably good job, with limited resources, of feeding the British people. But it often goes unrecognized that the British government was also responsible for the food security of its colonial subjects, and it was here that it often failed, most spectacularly in Bengal, where three million Indians died of preventable man-made famine. Unscathed by the ravages of domestic warfare, the United States was the only country with enough wealth to keep food controls to a minimum. The agricultural sector in fact strengthened significantly during the war, and domestic wartime food production ultimately led to the establishment of a global pattern of production and distribution. American-made food spread and shaped our food habits and tastes in the postwar world. These changes, combined with the advent of nutritional science, have created the food landscape we know today, where-despite increased knowledge on the importance of diet to health-the industrialized food we eat has the potential to make us sick. A work of great scope, The Taste of War connects the broad sweep of history to its intimate impact upon the lives of individuals. L I Z Z I E C O L L I N G H A M is the author of Imperial Bodies: The Physical Experience of the Raj and Curry: A Tale of Cooks and Conquerors. Having taught history at Warwick University she became a Research Fellow at Jesus College, Cambridge. She is now an independent scholar and writer. She has lived in Australia, France, and Germany and now lives near Cambridge with her husband and small daughter.